The symbols of Samobor are prescribed by Statutory Decision Statutarna odluka o izmjenama i dopunama Statuta Grada Samobora, adopted on 28 February 2007 by the Town Assembly and published on 12 March 2007 in the Town official gazette Službene vijesti Grada Samobora, No. 1. Decision Odluka o pecatu, grbu i zastavi Grada Samobora, adopted on 28 June 2007 by the Town Assembly and published on 29 June 2007 in Službene vijesti Grada Samobora, No. 4, repeats the descriptions of the coat of arms and the flag from the Statutory Decision. The flag is white with the coat of arms, bordered in yellow, in the middle. The symbols were designed by a Samobor-based company, Studio Grozić, led by Aida Corbo and Romano Grozić, as part of the general project of new visual identity they prepared for the town. During the carnival festivities that have long tradition in Samobor, one can see a flag with a magpie on it, which is the symbol of the carnival. The magpie is sometimes set in the coat of arms during the festivities as well. The coat of arms of Samobor is "Gules on a rocky base argent a tower embattled of the same between two thorny bushes". The historical coat of arms was renewed to match the modern state requirements (shape of the shield, removal of inscriptions). Samobor had much trouble getting the approval for it, since the State Archives considered that the coat of arms should be on a blue background, as it appears in some of the documents they have. However, it seems that they were finally convinced, since the Samobor citizens are collectivly convinced that red is the only appropriate color matching the town's firm tradition. The table flag of Somobor (photo) is vertical with the coat of arms in the centre. The white flag with the coat of arms in the middle was introduced some time around 1990, or even before it. The symbols are mentioned in the Town Statutes Statut Grada Samobora (pročišćeni tekst), adopted by the Town Assembly on 3 April 2006 and published on 11 April 2006 in Službene vijesti Grada Samobora, No. 2. The coat of arms, with the writing "SAMOBOR" and year "1242" (the year when Samobor received the Free and Royal Town grant from Croato-Hungarian King Bela IV), is based on the town seal preserved from the 16th century, circular with the same contents surrounded with inscription "S(igillum) COM(m)V(n)ITATIS DE ZAMOBOR". The seal was confirmed in 1525 by King Leopold II and subsequently, in 1528, by Ferdinand I. There is also a seal from the 18th century differing in some minor details. In 1909 the State Archives issued a document confirming the design of the coat of arms as: "On a red background on rocky base a tower of white stones with arched entrance and opened doors. Above the doors three and in the first floor four windows. To the left and right next to the tower are branches with golden and green twigs. Atop the tower is embattlement." Some historical sources show the shield background as blue. 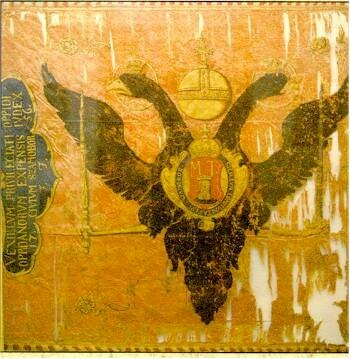 A flag of Samobor, dated to 1756 (photo), is apparently of red silk, somewhat detoriated, semee with golden roses, showing a black double-headed eagle displayed, both heads crowned, beaked and haloed golden, membered also golden holding in the right a sceptre and in the left a sword, between the two heads is a golden orb. On the breast of the eagle is on a golden cartouche and surrounded with a blue ribbon iscribed golden (probably the full ceremonial name of the town in Latin) crowned with a golden crown is the coat of arms of the town, "Gules a tower argent issuant from rocks proper between two thorny bushes and in chief letters 'MT' [Maria Theresa] argent'. Along the hoist is a blue cartouche inscribed with yellow in four lines: "Vexillum privii eciati oppidi / oppidanorum expensis iudex / 17. civivm Szamobor 56. / J. J. (?)". The flag is bordered on three edges with a red and white checky border. The reverse of the flag is painted with an iconographic depiction of Jesus on the cross. The flag, preserved in the Town Museum of Samobor (A HREF="http://buja.tripod.com/povijest.html">website), is the ceremonial flag that was hoisted during elections, other important events and church hollydays (documented report from 1830), and may have been in use as late as until 1918 or even later. The Samobor Museum preserves several other flags, like the flag of the Kingdom of Croatia used on the installation ceremony of Ban (Viceroy) Levin Rauch in 1869 and several guild flags. An article by Ivanka Brekalo, Iz pismohrane samoborskog muzeja: Samoborske zastave kroz stoljeća - "Varošku zastavu u muzikom sprevajali...", published on 2 March 2002 in Samoborski Glasnik, adds some more info on flags preserved in Sambobor.